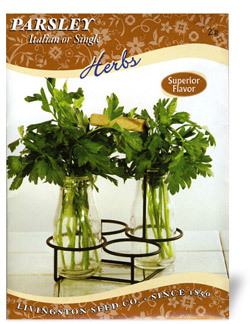 Italian Parsley has flat leaves that make this a prefered plant of gourmets. Its culinary uses include salads, soups, butters, fish, and poultry. Italian Parsley contains large quantities of vitamins and minerals such as calcium, iron, phosphorus, potassium, and magnesium. Great in window boxes and containers. Gardening Tip: Parsley grown near roses is thought to improve the scent and health of the roses.